all sorts of amusements and activities. 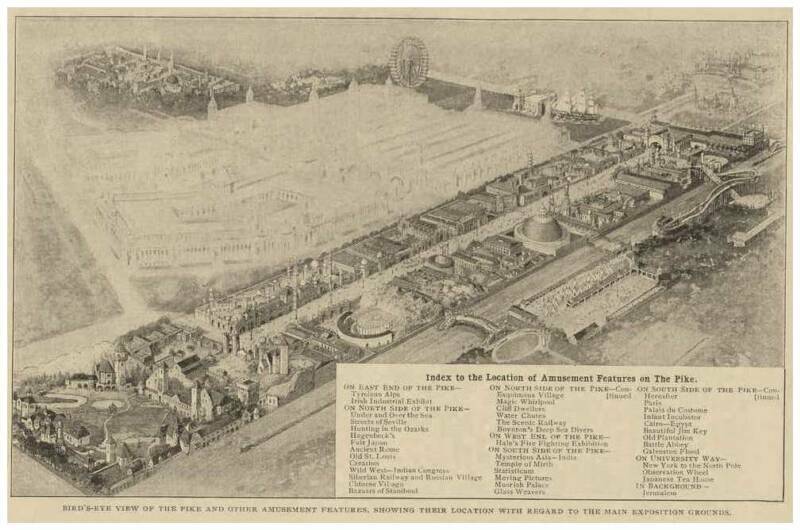 These rides, attractions and concessions were more varied, elaborate and costly (seven to eight million dollars), than any previous Exposition. 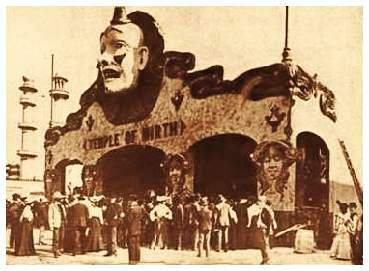 Some called it a headquarters for fun and entertainment, while others labeled it an over-elaborate carnival and a den of iniquity. The Pike wasn't actually a broad street that ran a mile long, it did turn south at the two ends, which created wider entrances to handle the enormous evening mobs. It was designed with 10 different styles of paving and a variety of street fixtures. of the Louisiana Purchase Exposition. Pike-goers could visit Constantinople, Cairo or even the North Pole; while in the same day take in a Paris fashion show, visit Blarney Castle or the Tyrolean Alps. One could experience the world's `Creation,' or `Hereafter,' or ride a burro or camel. Visitors could see elephants sliding down chutes, witness an epic naval battle or see forever atop the largest Observation Wheel ever built. A reenactment of the Galveston Flood could be viewed, or a visit to Jerusalem. with blaring brass bands for the fairgoer's attention. In the evening, with the palaces closing at dusk, the Pike was always crowded and attractions such as belly-dancing was quite popular. Frederick Remington's statue "Cowboys Off the Trail" (also entitled- "Cowboys Shooting Up A Western Town,"), greeted fairgoers as they walked into the Exposition's eastern entrance. 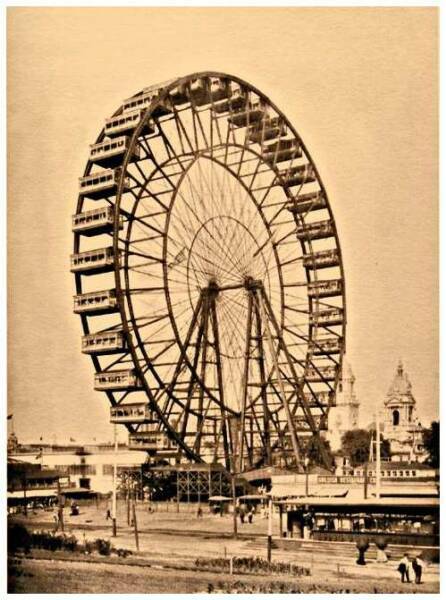 There they could witness over fifty attractions. Plans were made to make The Pike permanent after the Exposition- as well as adding a beach and a stadium, but Washington University cancelled them. Visitors along The Pike. The Battle Abbey is on the right. The Pike's Temple of Mirth. 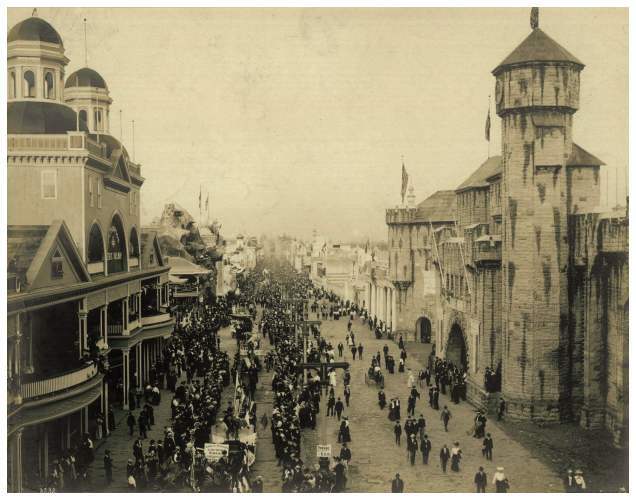 Crowds promenading along "the Pike, " a wet, brick boulevard at the 1904 World's Fair in St. Louis, Missouri. Some of the buildings at left have signs: "Western Union Telegraph and Cable Office, " "Indian Congressional..." Some of the buildings at right are topped by flags, and one bears a sign for "Café." Small signs outside the white building in the lower right of the photo read, "To toilets for women" and "Baby incubators." Please click on Pike Attractions (to your left), to see exhibits buildings.